Inspired by her love of Paris, Heather Hart brought to life a luxury salon in Newport Beach that exudes Parisian style. The Lavender Salon & Boutique at the new chic Castaway Commons on Westcliff Drive—next to Gratitude---offers an indulgent Parisian salon experience - including a luxurious blow-dry bar setting, five-star client service, and the crème de la crème of stylists and products. “Throughout my frequent travels to Paris, I have been constantly wowed by the Parisians’ attention to detail when it came to all things beauty and hair,” said Hart. “I’ve searched for more than a decade to find that same level of artistry, service and experience here in the U.S. Not finding it, I decided to take the best aspects of Paris’ most luxurious and exclusive salons, and meld them to create what is now Lavender Salon & Boutique." You get the feeling like Hart went all out in creating the perfect salon to give clients a feeling of being transported to a dreamy pampering oasis. It’s been reported the design cost more than a $1 million and includes handmade glass chandeliers, violet marble countertops, bespoke cabinetry and furniture, and original commissioned artwork. There are top-of-the-line Takara Belmont shampoo chairs, which offer first-class comfort during shampooing (clients can watch high-def 52” TV screens mounted on the ceiling during their shampoo). The color processing room also has personal TVs for each client and the world’s most advanced dryers - infrared domes with a rotating ring mechanisms that dry hair while staying completely silent. While you are waiting for a service, you can peruse a curated selection of hard-to-find coffee table books, a wide variety of domestic and international fashion and lifestyle magazines, and daily printouts of The Skimm. There’s even a bar that serves Starbucks lattes in Hermes mugs, Rosè Champagne from Paris, Lavender Bellinis and fruit- and herb-infused water. Lavender Salon is also a charming boutique with an international selection of beauty, gift and home items. 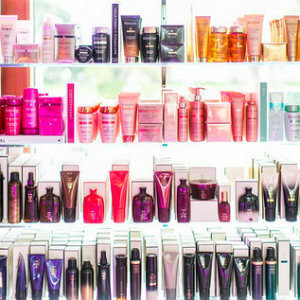 Exclusive brands to offer their full lines at Lavender Salon, including Kerastase, Oribe, R+Co, RMS, Smith & Cult, Newport-based Voluspa Candles and many more. In addition to hair care ranging from cut, color, extensions, Brazilian Blowout, balayage, hair tint, gloss and painting, Lavender Salon offers a full blow-dry bar available for walk-ins and by appointment. Full and partial makeup applications also are available, and a full-time esthetician is on staff to provide the latest in facial treatments ranging from waxing, to microblading, eyelash extensions, microdermabrasion, facials and much more. Lavender Salon is a perfect spot to prepare for a gala, a wedding, charity events, birthdays, and celebrations of all kinds. Open 8 a.m. to 7 p.m. Monday through Saturday; and 9 a.m. to 6 p.m. Sunday. Lavender Salon & Boutique is at 1617 Westcliff Drive, Suite 102 in Newport Beach. 949.515.2900.